Shutterly Fabulous double hungshutter style. Camberwell sash window double hung shutters. This detached property in Camberwell, South East London has been installed with Shutterly Fabulous shutters. The design of the shutters is the tier on tier shutter style. This is sometimes referred to as “double hung” shutters. These have the appearance of stable door shutters, they have a top tier and a bottom tier of shutters which can be opened back against the wall or the window recess one shutter tier independently if the other tier. Having tier on tier shutters or “double hung” shutters installed in your home gives your shutters fantastic flexibility as to how they are used, this was something that our Camberwell shutters customer discovered. 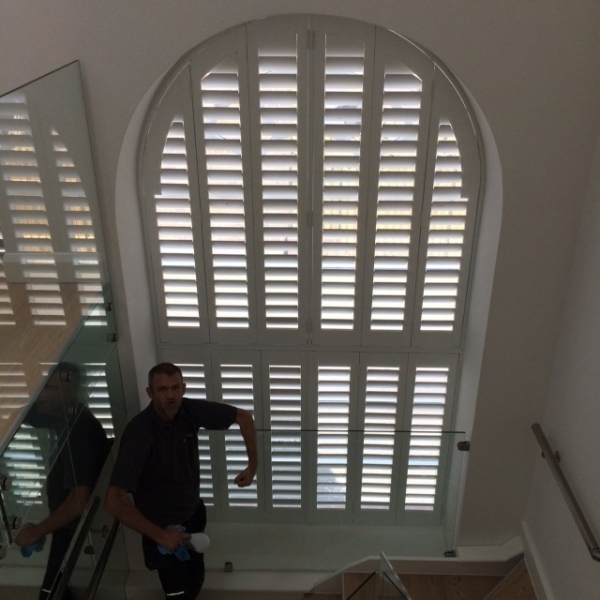 As the top tier of shutters can be opened independently of the bottom shutter tier, and vice versa, our Camberwell shutters customers have been able to let a huge amount of light into their rooms whilst still maintaining privacy by keeping the bottom tier of wooden shutters closed. The window shutters in this Camberwell property have been installed away from the windows to the front of the window reveal into the room. You can see in the image that the shutters appear far away from the windows. Our customers can request their bespoke shutters to be installed either tight to the actual window or to the front of the recess. Sometimes there may be factors which mean the interior shutters need to be fitted away from the window, such as window handles sticking out. If these handles protrude further forward than the actual window frame, and the shutter frame is fitted tight to the window, then the shutter slats will not be able to fully open and close properly. The shutter frame is therefore pulled away from the window towards the front of the recess to enable the slats to open and close fully in both directions.